Thirty-four NCAA team titles. 133 individual NCAA champs. Over 400 NCAA All-Americans. By any measure, Oklahoma State has built a wrestling legacy unmatched by any other college wrestling program over many decades. 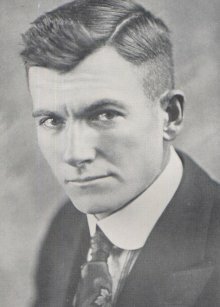 And the man who laid the strong foundation for that legacy is Ed Gallagher, Cowboys wrestling coach from 1916 through 1940. Born September 5, 1887 in Perth, Kansas, Edward Clark Gallagher was a natural athlete, running track and playing football in high school. As a student at Oklahoma State -- then called Oklahoma Agricultural and Mechanical College -- Gallagher set 100-yard dash and hurdle records that stood for thirty years. In 1908, he ran 99 yards for a touchdown against Kansas State, which still stands as an Oklahoma State record for longest run from scrimmage. After graduating from Oklahoma State in 1909 with an engineering degree, Ed Gallagher stayed in Stillwater as the school's track coach. In 1913, he was lured away to Baker College in Baldwin City, Kansas, where he coached all sports … however, two years later, he was back at Oklahoma State, serving as athletic director. During the 1914-1915 school year, Oklahoma State launched its wrestling program, with A.M. Colville as coach. That first season, the Cowboys wrestled only one dual meet � held in conjunction with a gymnastics event -- and were trounced by the University of Texas. The following year, Ed Gallagher took the helm of the wrestling program … despite never having wrestled in an organized program in high school or college. Ed Gallagher's lack of mat experience may seem stunning these days, considering today's top college wrestling coaches have resumes loaded with high school state and national wrestling titles, NCAA championships and even international mat honors. Yet, when Gallagher was in school, organized wrestling programs were rare, outside those at YMCAs and men's clubs, or at eastern colleges … so opportunities to compete on the mat were very limited for someone from the Great Plains such as Gallagher. The lack of on-the-mat experience ultimately didn't hurt Ed Gallagher and his Oklahoma State wrestlers. Admittedly, Gallagher's first season as head coach (1915-16) was a losing one; the Cowboys again had just one dual meet, again losing to Texas, this time by an even more lopsided 22.5-2.5 score. However, in his second year, Gallagher's matmen wrestled three duals, winning two (against Emporia State and Texas), and tying with Arkansas. wrestling program throughout the 1920s and 30s. As an engineer, Ed Gallagher employed a systematic approach to the sport of wrestling … starting with how he selected young men to wrestle for Oklahoma State. He looked at their families, picking sons of "upstanding" parents … and favoring "only boys who cannot go out in society." In other words, those who might be considered economically disadvantaged, and would view wrestling as a springboard for success in life beyond the mat. Gallagher also expected his wrestlers to live clean -- no smoking, no drinking, and, perhaps most startling nowadays, no dating. "The best woman in the world can do you no good," claimed the Cowboy coach. (No, Gallagher was not a confirmed bachelor; he married right out of college, and together, Ed and the former Mary Austella Taylor had a total of six children -- three boys, and three girls.) Along with clean living off the mat, Gallagher stressed clean behavior on the mat. He wanted his men to wrestle tough, with determination … but with character, and good sportsmanship. In selecting wrestlers for his program, Gallagher also favored a specific type of physique. He sought "lean plainsmen" -- tall, slim, strong men, rather than compact, muscular types who were typical in college wrestling even 80-90 years ago. Ideally, these long, lean wrestlers must have quick reactions, according to the coach's criteria. Ed Gallagher's engineering background also guided his primary focus -- the study of leverage, and how it applied to wrestling. Using a human skeleton and rubber bands, he spent hours figuring out holds and counters -- one report saying he spent at least two hours a day in his office on this task. The Cowboy coach developed, by his own count, 400-500 holds and variations; he expected each of his men to know at least 200 of those. Perhaps most surprising, Ed Gallagher was open about sharing his scientific approach to wrestling. 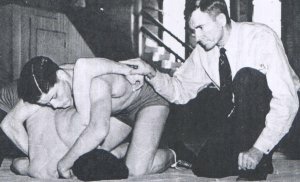 His teams often put on wrestling demonstrations before or after a dual meet in an opponent's gym. In 1939, he and his Cowboys were featured in a three-page "how-to-wrestle" feature for the popular photo-magazine, "Life." In addition, he wrote two very popular instructional books, titled simply "Amateur Wrestling" and "Wrestling." Here's a specific example of how the engineer in Ed Gallagher guided his instruction of his wrestlers: He told them to think of an opponent on all fours as a table. To succeed, his wrestlers need to "break" at least one leg of the table. If the opponent's arms were weak, that was the point of attack; if the arms were strong, go for the legs. Another way to "break" an opponent, according to Gallagher: Make more than one attempt or counter. Continue a string of attacks until you have opponent under control. In other words, never give up. Not all of Ed Gallagher's ideas came from his own engineering mind. According to the book about the history of the Oklahoma State wrestling program, "Cowboys Ride Again!" Gallagher picked up a tip from 1920s professional wrestling champ Ed "Strangler" Lewis: If possible, "take two deep breaths and immediately pitch back viciously. To do this correctly, break out of the predicament first, and, step back and draw the breaths. Now, he (the opponent) will see this and either follow suit or at least temporarily relax, and you can catch him somewhat relaxed." Coach Gallagher made a science of studying the diet of his wrestlers. He generally allowed his wrestlers to eat what they wanted, as long as it what was what they typically consumed, in reasonable quantities. However, he discouraged his wrestlers from consuming cold drinks. He focused on glycogen, the form in which sugar is used in the body, turning one-third of that into carbon dioxide, and the remaining two-thirds to water and lactic acid -- the cause of oxygen debt, leading to hard breathing during exertion in workouts and during a wrestling match. After weigh-ins, instead of chowing down with a big meal as most wrestlers did in the 1920s and 30s, Gallagher's wrestlers usually contented themselves with hot tea, sweetened with brown sugar, honey or Karo syrup. He wanted his men to be "properly sugared" especially when trying to make weight. College wrestling of the Ed Gallagher era differs significantly in a number of ways from the sport we know today. For starters, the Cowboys wrestled just 5-8 dual meets in a typical season in the 1920s and 30s. Each regulation match lasted ten minutes. There was no point scoring system; matches were won by a pin (back then, shoulders had to be on the mat for a full three seconds), or by "time advantage" -- essentially, whoever had the most riding time. In 1938 -- towards the end of Gallagher's coaching career -- this system was replaced, with the referee making the decision as to who won. The referee decision system didn't last; in 1941, the beginnings of today's point system made their appearance in college wrestling. Perhaps the most startling difference for today's fans: For home meets, the Oklahoma State wrestlers competed in a roped-off ring, like those for boxing or professional wrestling. The actual wrestling area was the same as on-the-floor mats in other college events. In reviewing "NCAA Wrestling Guides" of the era -- the annual rules-and-results publication for high school and college wrestling -- there are diagrams governing ring size, number of ropes, what the ropes should be made of, and how they should be secured… but nothing about rules governing how the ring could be used. The only hint: In "Cowboys Ride Again!" there's a description of a match in which an angry Oklahoma State wrestler threw an opponent over the top rope, which apparently was against the rules… but the Cowboy wasn't disqualified, and the match resumed. The gear Ed Gallagher's men wore to wrestle was radically different, too. No one-piece black-and-orange, synthetic-fabric singlets for the Cowboys back then. During the more than two decades Gallagher coached at Oklahoma State, his wrestlers wore a variety of uniforms. Through much of the 1920s, his wrestlers wore full-length wool tights. There was a time where the Cowboys wore tights with what was called a black Tom -- also known as an outside supporter -- on top of the tights. Towards the late 1930s, Gallagher's wrestlers usually wore wool trunks, much like we associate with pro wrestling, with no tights. Despite these variations in what the Cowboys wore below the waist, throughout the 1920s and 30s they usually wrestled bare-chested at home meets and at events at colleges in the Midwest and southwest. 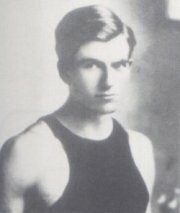 However, when wrestling in the east, Gallagher's wrestlers would often be required to put on sleeveless shirts, at the request of the school hosting the event. (An NCAA rule change in the mid 1960s prohibited shirtless wrestling.) Going all the way to the top … headgear was not required as it is now, and a very rare sight in the Gallagher era. When not wrestling, the Oklahoma State wrestlers often traveled in gear appropriate to their team name. Outfitted in Stetson hats, colorful flannel shirts, and cowboy boots, team members made an incredible impression wherever they traveled. Adding to the Cowboy mystique, some team members performed rope tricks in opponents' gyms before some dual meets. No matter what they wore -- or whether they wrestled in a ring or mats on the floor -- Ed Gallagher's Oklahoma State Cowboys dominated the college wrestling scene for more than two decades. In the years after World War I, the Cowboys never had a losing season. In fact, in the eleven-year period from the 1919-20 through the 1930-31 seasons, the Cowboys never lost a dual meet. That's 70 consecutive wins! Among the Cowboys' opponents during the Roaring Twenties: University of Oklahoma, University of Kansas, Kansas State, Texas, Iowa State, Cornell College of Iowa … as well as farther-flung teams such as West Virginia, the U.S. Naval Academy, and the Philadelphia Athletic Club. Who broke the eleven-year, 70-match winning streak? Cross-state rivals Oklahoma. The Sooners beat the Cowboys by one point in the last dual meet of the 1931-32 season. During the rest of the decade, the Cowboys had only one other loss (at Southwestern Oklahoma State in the 1936-37 season) … and three ties. Most victories were by a substantial margin. In 1928, the NCAA launched a national wrestling championship to conclude the dual-meet season. At the very first NCAAs -- held at the Armory at Iowa State -- Oklahoma State claimed four individual titles out of a total of seven weight classes. That was no fluke; in the thirteen years of NCAA competition, the men coached by Ed Gallagher ruled the national championships each year. The leanest year for Cowboys was 1936, when just one wrestler -- Harley "Doc" Strong -- won a title. However, in a typical year, at least three Cowboys brought home an individual championship. During the Gallagher era, 22 individual wrestlers won a total of 37 NCAA titles. Among the Cowboys who won three championships (back when freshmen were not eligible for NCAA/varsity competition): Earl McCready (the very first three-time college champ), Jack VanBebber, Conrad Caldwell, Rex Peery, Ross Flood, Joe McDaniel, and Stanley Henson. Ed Gallagher's men did incredibly well on the ultimate international stage, too. From 1924 through 1936, Oklahoma State had fifteen wrestlers qualify for the U.S. Olympic wrestling teams … along with Earl McCready wrestling for his native Canada at the 1928 Olympics, and Canadian big man George Chiga competing for his home team at the 1936 Olympics. Of these Cowboy Olympians, four earned medals in freestyle competition. At the 1932 Olympics in Los Angeles, Bobby Pearce won gold at 123 pounds, while Jack VanBebber claimed gold at 158.5. In the 1936 Berlin Olympics, Ross Flood brought home a silver medal at 123 pounds, and Frank Lewis won gold at 158.5. For years, Ed Gallagher dealt with the challenges of Parkinson's, the same disease afflicting legendary boxing champ Muhammad Ali and actor Michael J. Fox today. 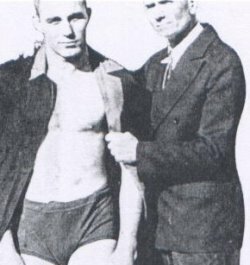 In 1936, Oklahoma State and the entire Stillwater community put on a fundraising event at the school's Lewis Field football stadium so that coach Gallagher could travel with his wrestlers to the Berlin Olympics … then take a side trip to Vienna to be tested by physicians there, at the request of his son Clarence, a doctor. To help lighten his load, in 1938, Ed Gallagher retired as director of physical education at Oklahoma State, but continued on as wrestling coach. It was about this time that construction began on a new, $500,000 arena on the Oklahoma State campus that would serve as home for the Cowboy basketball and wrestling programs. Completed in 1939, what was originally called the 4-H Club and Student Activity Building was state-of-the-art for the time, featuring an air-cooling system … and over 5,000 theater-type seats, as well as collapsible bleachers for wrestling events, bringing total seating capacity to nearly 9,000 fans. February 3, 1939 was declared "Gallagher Day" in Stillwater, in honor of the beloved wrestling coach. It was that day that the new arena -- nicknamed "the Madison Square Garden of the Midwest" -- was officially dedicated. That night, the facility hosted its first event, a dual meet with Indiana University, one of the top programs of the era. The Cowboys defeated the Hoosiers 18-9. At the end of the 1939-40 season, outdoorsman and hunter Ed Gallagher went to the Rocky Mountains for an extended vacation. While in Colorado, he collapsed and died on August 28, 1940 … just a week shy of his 54th birthday. His funeral was held at the new arena that had been named in his honor (and is still home to the wrestling Cowboys, now called Gallagher-Iba Arena, having been substantially upgraded and expanded in 2001.) Thousands came for the funeral for the man referred to in obituaries as "the Dean of Collegiate Wrestling" and "the Knute Rockne of the Mats" (referring to the legendary Notre Dame football coach killed in a plane crash a few years' earlier). "The big news about Ed Gallagher is that he is improving in health! In recent weeks he has found a new medicine, the result of long search by his son, Dr. Clarence Gallagher, and evidently it is effective. Ed has gained nearly twenty pounds in weight. He is more cheerful, more hopeful. He is optimistic about the future. In fact, he has made a date to go quail hunting next fall. It will be his first time in about five years. When Ed gets back to quail hunting, he will be the Ed Gallagher of old." In tallying up the accomplishments of the Ed Gallagher era, the stats are impressive: 19 undefeated seasons out of 23 … only two losses in the last nine seasons … six AAU (Amateur Athletic Union) team titles … ten outright NCAA team titles (tied for first for an eleventh)… 73 NCAA and AAU individual champs … and three Olympic gold medallists. Ed Gallagher's legacy goes far beyond those stats. He coached a number of wrestlers who went on to become high school and college wrestling coaches themselves. Among the Cowboys turned coaches: Cliff Keen at the University of Michigan … Paul Keen at Oklahoma … Buell Patterson, who coached at Kent State, Nebraska and Illinois… Rex Peery at Pittsburgh … Fendley Collins at Michigan State … Joe McDaniel at Syracuse and Wyoming … and Orion Stuteville at Northwestern. Buell Patterson weighed in with his thoughts on coach Gallagher: "A reason that the men who have worked under Ed like him so well is that if he lost a match, they never received a bawling out. And believe me, it is a lot of satisfaction to give all one has for a man and know that what one gives will be satisfactory with him, even if one makes mistakes." Another one of his coaching prot�g�s, Carl "Dutch" Voyles (who coached at Duke, and William & Mary), said of his mentor: "No one ever said an unkind word about him. That must have been because Ed was so full of kindness himself … there are all too few men like Gallagher in this world of ours." "Applicable adjectives, on which Ed's friends all agree as describing him, include honest, fair, clean, square, quiet, unassuming, uncomplaining, canny, crafty, foxy, firm, shrewd, fearless, modest, sincere, stubborn, determined, and uncompromising � altogether friendly and possessing a fine sense of humor…"
"Gallagher has never been cocky, or disagreeably boastful. He has taken his victories graciously. He has never complained about a referee's decision -- at least not publicly." The legacy of Ed Gallagher lives on in so many ways, beyond having his name on an arena … or the annual award that bears his name, given to an Oklahoma State wrestling alumnus. (Among the past honorees: Bobby Douglas, Doug Blubaugh, John Smith, Pat Smith, and Kenny Monday.) His analytical, engineering-based approach to amateur wrestling revolutionized the sport. The success of his Cowboys helped launch high school wrestling programs throughout the state of Oklahoma, making the Sooner State a leading hotbed for wrestling to this day. What's more, the foundation of success laid by Ed Gallagher and his wrestlers has been built upon over the decades to the point where today, the Oklahoma State Cowboys still claim the most individual and team titles in NCAA wrestling. To read more about one of Ed Gallagher's champions, Jack VanBebber -- winner of three NCAA titles and an Olympic gold medal, click HERE. Gallagher produced three NCAA heavyweight champs -- Earl McCready, Lloyd Ricks, and Johnny Harrell. To read more about them -- and the seven other Cowboy big men who won NCAA titles, click HERE.